“Chemicals” in the title of the 2008 paper really means dextran sodium sulfate, which induces severe acute colitis. Gewirtz’s team (the first author was Matam Vijay-Kumar) found that not only can flagellin reduce the damage caused by this chemical, it can reduce mortality when mice are challenged with Salmonella typhimurium, rotavirus and protect against a lethal dose of gamma radiation. These results are a stark demonstration of how important intestinal damage is to mortality after radiation, and suggest that flagellin could be used in some kind of civil-defense capacity as well as helping patients receiving radiation therapy. 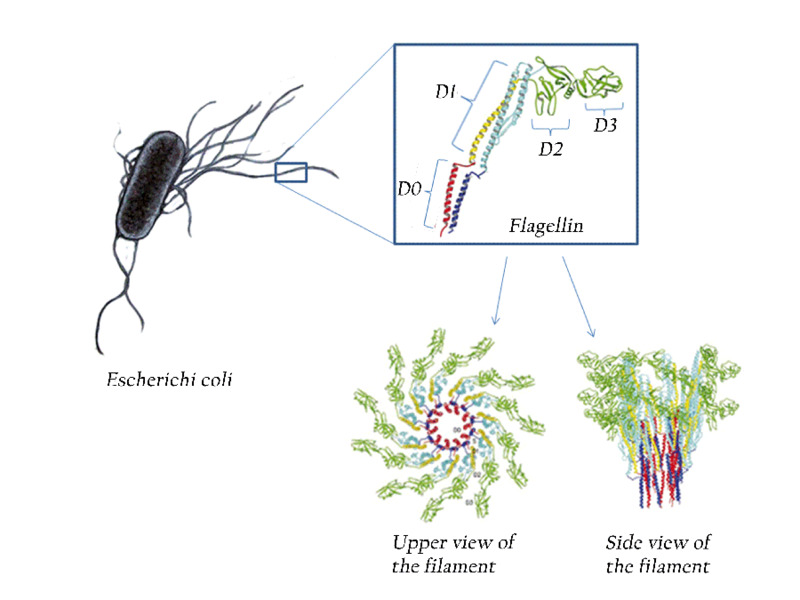 Flagellin is such a versatile tool because our immune systems have evolved ways to detect bacteria that involve recognizing common structural elements that many bacteria have in common. This is both more primitive and also more broad-based than relying on, for example, antibodies that recognize one specific type of bacteria. Flagellin both strengthens defenses in the intestine, and stimulates immune cells that can go after invaders. One of the signals cells send out in response to flagellin is G-CSF (granulocyte stimulating factor), which is used as a protective agent in the setting of radiation therapy for cancer. Since flagellin is such a potent stimulant for the cells that make up the mucosal barriers under assault by influenza, microbiologists Ioanna Skountzou andÂ Richard Compans have been investigating whether flagellin would make a good component of an influenza vaccine. Compans is director of Emory’s Influenza Pathogenesis & Immunology Research Center. Also at Emory, postdoctoral researcher Mohammad Hossain and hematologist Edmund Waller have been testing flagellin’s ability to promote healthy immune reconstitution and prevent graft-vs-host disease after a bone marrow transplant.